Shoulder Replacement surgery replaces the damaged or diseased head of the humerus (also called the ball) and cartilage from the shoulder joint with a metal and plastic joint. Although shoulder replacement is less common than knee or hip replacement in Omaha, it is just as successful in relieving joint pain. 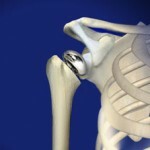 Total Shoulder replacement surgery was first performed in the United States in the 1950s to treat severe shoulder fractures. Over the years, shoulder joint replacement has come to be used for many other painful conditions of the shoulder, such as different forms of arthritis. If nonsurgical treatments like medications and activity changes are no longer helpful for relieving pain, you may want to consider total shoulder replacement surgery. Shoulder replacement surgery is a safe and effective procedure to relieve pain and help you resume everyday activities in Omaha. Whether you have just begun exploring treatment options or have already decided to have total shoulder replacement surgery in omaha, this article will help you understand more about this valuable procedure.